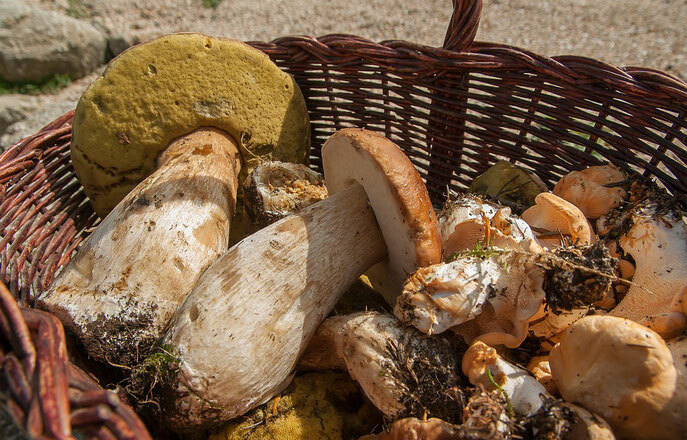 The ideal hunting grounds for finding cèpe mushrooms remain a closely guarded secret. This valuable mushroom cannot usually be found in large quantities and so those 'in the know' tend to keep such information to themselves. Play your cards right, however, and you may just get given a few by a friend or neighbour, but ask them where they were found and they will probably start to mumble in very vague terms! So what can you do to find your own cèpe corner? Firstly you will need to know how to identify cèpe mushrooms, otherwise known as the edible Boletus family of fungi. In the photo above, the cèpes are the larger mushrooms on the left. The mushroom cap will look like a slightly greasy bun and the colour can range from yellow brown to a reddish brown. The caps can grow as large as 30cm (12inch) when mature and weigh up to 1kg (2lb) with a stem of about the same weight. The stem shows a very faint net or web pattern and is very solid and white. If in doubt, cut it. The flesh should remain white. Cut your mushrooms low down at the ground or twist them free. Don't just pull them out, as this will destroy their mycelium (root system). if you have doubts about whether you have found a cèpe or something else you can ask an expert, but they will need to see the whole mushroom to be sure. Every year people die from eating toxic wild mushrooms, incorrectly identified. French pharmacists are offered training in mushroom identification but not all choose to do it. They can probably point you towards someone with the right expertise, however. Once you're pretty sure you know what you are looking for, you'll need to understand the best environment for the cèpe to grow. Trees are vital for creating the right conditions. Here in the South-West of France, oak and chestnut forests are the best places, whereas beech trees are a good 'host' in the North and in the Southern mountainous areas. You might expect to find the main varieties of cèpes: boletus aereus, boletus aestivalis and boletus edulis. The latter, boletus edulis, or the cèpe de Bordeaux can also sometimes be found under birch trees. An ability to identify these trees is therefore important in the hunt for cèpes. However, the right species of tree is not always the only indicator. Sometimes the favourable environment is reached at a certain stage in the life of a tree. For example, relationship between the oak and the cèpe mushroom starts when the oak reaches the average size of a 7 year old tree (for trees, size matters more than years). But at this age, the symbiosis will not produce a carpophore (the cèpe that you pick). It is necessary to wait until your oak reaches the average size of a tree 20 years old, before the first cèpes appear. In practise, this means that if you stroll through an ecosystem of medium-sized oaks below the reference size of a 20 year old oak, you have almost no chance of finding cèpes. In addition, when the network of roots of the tree has expanded considerably, the productive relationship becomes superfluous as the tree no longer needs the cèpe mycelium. In this case, either the production of cèpes ceases completely, or it comes back cyclically (and in sometimes considerable proportions), for reasons that specialists still have trouble explaining. Finally, disease and old age also make trees unsuitable for cèpes. Here is a short video of a successful hunt for cèpes. If you find it a little fast, click on the settings in the bottom right-hand corner to slow it down a little. The one thing is sure - you will have to get up early to find a good crop, or someone else might get there first! Mild weather followed by some rain, or waiting for a few days after a full moon or during a waxing moon are the best moments according to some. But if all else fails, you will have a pleasant walk in the forest at this most wonderful time of year. Just in case, make sure your cupboards are stocked with some dried cèpes (we are also told that the frozen cèpes you can find in French supermarkets are very good), so that if your hunt is unsuccessful you can still have your well-deserved cèpe omelette when you get home!